Dr. Simon Wing. This endocrinologist’s gift of stock in 2012 commissioned a communion table for Montreal Chinese Presbyterian Church in memory of his father, James Wing, and the 1000s of Chinese immigrants forced to pay the head tax. While Donald Smith was driving the symbolic last spike at the ceremony celebrating the completion of the trans-Canada railroad in 1885, there was one group conspicuously absent from the festivities – the Chinese immigrants who had provided much of the labour building the railroad. Even though 4,000 Chinese (nearly 1 in 4 workers) died in the dangerous work, they received no recognition or thanks for their contribution. Indeed, after their labour was no longer needed to build the railroads, new Chinese immigrants who came to Canada from 1885-1923 had to pay a “head tax” (equivalent to two years wages at the time) to gain entry into the country. Then, with the enforcement of the Exclusion Act from 1923-1947, no Chinese were allowed to immigrate to Canada, not even family members of those who had already settled in our country. It wasn’t until 2006 that the Canadian government apologized to the Chinese community for the injustices done to them and gave $20,000 as compensation to the Chinese who were still alive and who had been forced to pay the discriminatory tax. One of those who received compensation was James Wing, who came to Canada in 1923. Wing was a very active elder at the Montreal Chinese Presbyterian Church for over 40 years and also a leader in the Chinese community in Montreal and was featured in the documentary film, Moving the Mountain , which tells the story of the head tax and the Exclusion Act and their impact on the Chinese community. 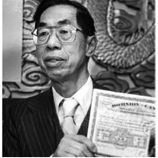 James Wing, born Ng Wing Wah, with the head tax certificate issued to him in 1923. Photo: Pierre Obendrauf. Wing passed away in 2008, but his son, Dr. Simon Wing, an endocrinologist teaching at McGill University, is keeping his father’s memory alive and the hardships the Chinese community endured during those oppressive times. And the way Dr. Wing is doing this is quite beautiful and powerful. In 2012, Dr. Wing gave a gift of stock to The Presbyterian Church in Canada, which he designated for a new handmade communion table for the Montreal Chinese Presbyterian Church in memory of his father and the thousands of other Chinese immigrants forced to pay the head tax. What a wonderful way, not only to remember his father, but to also remember Him who gave his life to unite all nations and races into one family of faith!